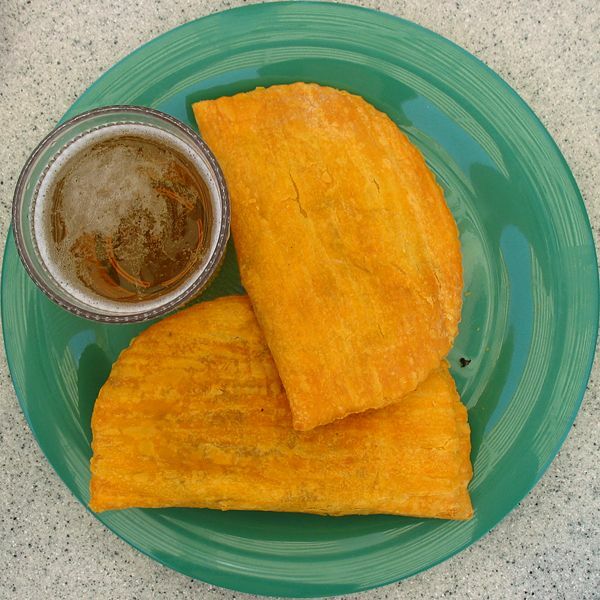 A Jamaican patty is a pastry that contains various fillings and spices baked inside a flaky shell, often tinted golden yellow with an egg yolk mixture or turmeric. It is made like a turnover but is more savory. As its name suggests, it is commonly found in Jamaica, and is also eaten in other areas of the Caribbean, such as Costa Rica's Caribbean coast. Left: Jamaican patties and a Red Stripe beer. In Haiti, the pastry is thick and crispy, making it essentially a turnover. It is traditionally filled with seasoned ground beef, but fillings can include chicken, vegetables, shrimp, lobster, fish, soy, ackee, mixed vegetables or cheese. In Jamaica, the patty is often eaten as a full meal, especially when paired with bread. It can also be made as bite-sized portions called cocktail patties. Amongst the Jamaican diaspora in the UK, the pastry is more like that of a suet crust, and often made with the fat from Curry Goat which provides the yellow color. The beef patty is a product of colonialism and migration developed after the introduction of the English turnover in the Caribbean, mixed with cumin and curry seasonings of East Indian indentured servants in Jamaica and cayenne pepper from African slaves. Jamaicans brought recipes for the patties northward in the 1960s and 1970s when many came to the United States as hospital orderlies, home health aides and nurses. In recent years, the Jamaican meat patty is found pre-made and frozen in Britain, Canada, and the US (primarily New York City and South Florida).